Here's an overview of the basic jargon used in cabling and we'll explain more as we go along. To begin with, what do we call this whole area of cabling? It's the infrastructure for telephone and LAN connections in most commercial installations and even in some modern homes. It's also used for fire alarms, building management, audio and video. Structured Cabling: An architecture for communications cabling specified by the EIA/TIA TR42 committee and used as a voluntary standard by manufacturers to insure interoperability. Structured cabling is based on a number of industry standards - voluntary standards - developed by manufacturers who want their products to interoperate - work together. They meet in committees several times a year and decide on the specifications of their products. These common specs mean that equipment will work on any cabling system that follows the standards and most cabling components can be interchanged without adversely affecting performance. EIA/TIA: Electronics Industry Alliance/Telecommunications Industry Assn, an industry trade association that creates voluntary interoperability standards for the products made by member companies. EIA/TIA 569: Covers pathways and spaces. Defines the "telecom closet" or telecom room as it is now called. 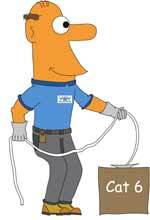 EIA/TIA 570: For residential cabling. Standards are not code! They are voluntary interoperability specifications. However every installation must be compliant to local building codes for safety! NEC (National Electrical Code): written by NFPA (National Fire Protection Assn.) this code sets standards for fire protection for construction and is a legal requirement in most cities. Telecom Closet (TC): The location of the connection between horizontal cabling to the backbone. Now often called "Telecom Room" to imply it's usually bigger than a closet! The Types Of "Low Voltage" Cable. Category 3,4,5, 5e, 6, 6A: Ratings on the bandwidth performance of UTP cable, derived from Anixter's Levels program. Cat 5e (enhanced) is rated to 100MHz. Cat 6 standards for UTP at up to 200 MHz, Cat 6A for 500 MHz and Cat 7 is also discussed for the future, but only in Europe, not the US. 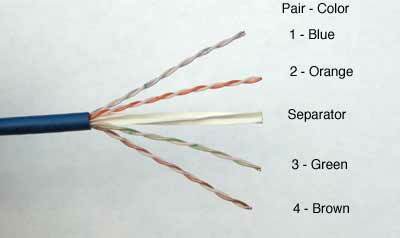 A typical Cat 6 cable is shown below. Optical Fiber: Both multimode and singlemode fiber are included as well. See Lennie Lightwave's Guide to Fiber Optics for more information on fiber optics. RG-6/RG-59: 75 ohm coax used for video. RG-6 is the standard for CATV, RG-59 is used on some short CCTV networks. 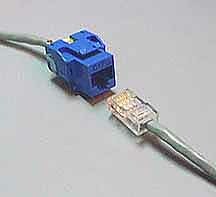 RG-58: 50 ohm coax used for "Thinnet" Ethernet. The connectors for UTP are also standard - used on every cable for Cat 3, 5, 5e, 6, but must be rated for the same performance level, e.g. Cat 6 hardware on Cat 6 cable. RJ-45: The popular name of the modular 8 pin connector used with UTP cable in structured cabling systems. Jack: The receptacle for a RJ-45 Plug. Plug: The connector put on the end of UTP cable. Punchdown: A connecting block that terminates two cables directly. 110 blocks are most popular for LANs, 66 blocks for telco, but some installers use BIX or Krone. After installing the cables, they must be tested. Every cable, including Cat 3 for telephones, must be tested for wiremap, but cable certifiers will test for all the parameters listed below. Wiremap: All eight wires must be connected to the correct pins, and the test is called a wiremap test. Attenuation: The reduction in signal strength due to loss in the cable. NEXT: Near End Cross Talk, or the signal coupled from one pair to another in UTP cable. ELFEXT: Equal level far end crosstalk; crosstalk at the far end with signals of equal level being transmitted. Propagation Delay: The time it takes a signal to go down the cable. DC Loop Resistance: The DC resistance of the cable in ohms. Delay Skew: The maximum difference of propagation time in all pairs of a cable. Power Sum ElFEXT: ELFEXT for the sum of the other 3 pairs on the 4th pair. All versions of Ethernet also have fiber optic connection standards. Power over Ethernet: The IEEE 802.3 Ethernet committee added provisions for powering devices off the pairs in a 4-pair UTP cable. 25+ watts of power are available, adequate for powering local swithches or hubs, some wireless access points and VoIP phones from a UTP cable, thus saving cabling costs. Most LANs today include wireless access points. Wireless is by no means wireless, as it requires wiring to connect it to the network. It merely replaces patchcords with a wireless link to allow roaming within a limited area. Wireless requires many access points connected (over wire or fiber) into the backbone.